Chromebooks, Google’s cheap, modestly powered laptops, make up just a tiny percentage of notebook sales. But Microsoft is freaking out about them. Late last year, Microsoft (MSFT, Fortune 500) launched a seemingly random, preemptive campaign against Chromebooks in a series of TV commercials. The ads attacked Chromebooks’ lack of functionality and compatibility compared to Windows. At the time, the ads seemed unnecessary: About 90% of the world’s PCs run Windows. But fast forward six months, and it’s becoming clearer why Microsoft is trying to nip this threat in the bud. An NPD report indicated that Chromebooks accounted for 21% of commercial U.S. notebook sales last year, though that only included sales in business and education spaces.Lenovo (LNVGF) and HP (HPQ, Fortune 500), two of the biggest PC makers, have added Chromebooks to their laptop lineups over the past year, joining Samsung (SSNLF) and Acer. Google’s (GOOG, Fortune 500) Chrome OS itself continues to grow more and more functional by the day. And at the beginning of March, Samsung released its 13-inch Chromebook 2, which aspires to be more than just an entry-level, bargain laptop. Equipped with a 1080p high-definition display and Samsung’s top mobile processor, Samsung is confident its Chromebook can go toe-to-toe with a comparable Intel (INTC, Fortune 500)-powered device. That said, overall market share for Chromebooks is still small. Chromebook sales for 2013 represented somewhere around 1% of total global notebook sales last year, according to Nomura. But they’re obviously catching on in the United States, and some analysts, including Nomura analyst Rick Sherlund, only expect that figure to grow. Since the PC industry’s growth has gone flatter than a map drawn in the Dark Ages, any faint trace of momentum is promising — or terrifying, if you’re Microsoft. Samsung says consumers are starting to embrace and understand Chromebooks, which essentially only run the Web. The company says it has noticed a drop-off in retail returns of Chromebooks, which Samsung attributes to Google’s improving Chrome OS software and the Chromebook hardware being more usable for the average person. But there’s a larger shift at play as well. Smartphones and tablets are becoming more powerful, and the PC is becoming less important for our daily needs. Outside of what we do at work, most of what we actually need a laptop for is what a Chromebook is limited to: Web browsing. We are fast approaching a reality where the Internet is omnipresent and devices use the cloud — and not USB cables — to talk to one another. Even the few offline tasks — word processing, spreadsheets, and media consumption — can be carried out on a Chromebook nearly as well as on a PC. Chromebooks haven’t become objectively better than Windows PCs, and they’re not selling by the truckload. But Chromebooks are ready for mainstream adoption. They’re starting to make many of us realize how non-essential a $1000 laptop is becoming. And they can compete with most of the cheaper laptops. We often tease Samsung about the seemingly arbitrary way it divvies up its tablet offerings — not content with round numbers, it’s released tablets that are 10.1inches wide instead of 10, 8.9 instead of 9, 7.7 instead of 8, and so on. 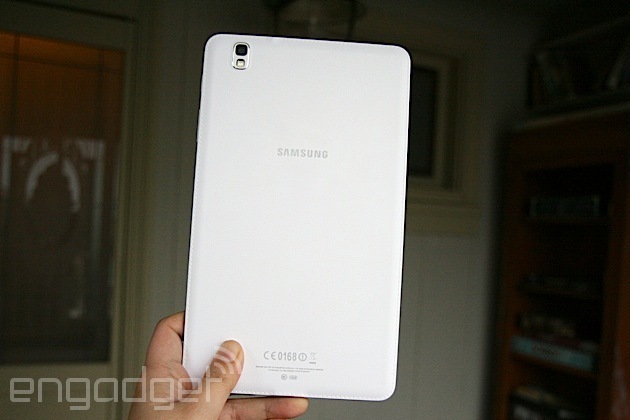 And so too is the case with the Samsung Galaxy Tab Pro 8.4, whose extra 0.4 inch seems unnecessarily tacked on. Yet, this results in a 16:9 aspect ratio that makes it well-suited for watching movies, which makes us willing to forgive its silliness. Plus, even if that weren’t enough to sway us, there’s so much else to like about Tab Pro 8.4 that the odd screen size is but a minor detail. Indeed, while Samsung released its latest Galaxy Tab Pro line of tablets in both 10.1 and 12.1 inches, it’s the 8.4-inch model that’s likely to win the hearts of most. Why do I say that? Simple: Portability. Just like the iPad mini with Retina display, the Galaxy Tab Pro 8.4 offers a sharp tablet in a travel-friendly form factor. Except, of course, the Tab Pro 8.4 runs Android, and is thus an alternative for those who’d like a premium 8-inch tablet without having to lock themselves into iOS. And that’s not all that the tiniest Tab Pro has going for it: The display is pin-sharp; the design is handsome; and the quad-core processor is not to be sneezed at. But at $400, it’s not exactly cheap and it’s also got some serious competition. I didn’t think that extra 0.4 inch would differentiate the Galaxy Tab Pro from previous models like the Galaxy Tab 3, but it does. The Tab Pro is noticeably taller, and like an adolescent wearing an ill-fitting suit, it looks a little, well, stretched out. Once I started using the tablet on a regular basis however, that additional length soon became an asset rather than an oddity. It provides just a touch more head space when browsing lengthy web pages and when turned on its side, its 16:9 aspect ratio lends itself well to watching movies and TV shows. But before I get to the display, let’s take a brief tour of the hardware. Like last year’s Galaxy Note 3 and the recently released Note Pro 12.2, the Tab Pro has a faux-leather exterior — everything from the pebbled back to the “stitching” on the sides is actually made from plastic. Yet, as much as I hate to admit it, this design trickery gives the Tab Pro a premium feel that sets it apart from the last generation of Galaxy Tabs, whose glossy plastic left much to be desired. Add in some metallic accents and the Tab Pro looks like it would fit right in at a Parisian fashion house. Speaking of fashion-forward looks, I’d be remiss if I didn’t mention the Tab Pro’s slender, lightweight build. Measuring 8.62 inches long, 5.06 inches wide and 0.28 inch thick, the tablet features rounded corners and tapered edges, both of which make it easy to hold in the hand. Scratch that: I should say hands instead, as the slate’s 11.85-ounce weight and extra length make it much too top-heavy to use one-handed. The front of the Tab is simple and uncluttered. Samsung’s logo is proudly displayed up top near the front-facing 2-megapixel camera. Along the bottom are the usual task-management and back navigation soft keys plus a slightly raised home button. 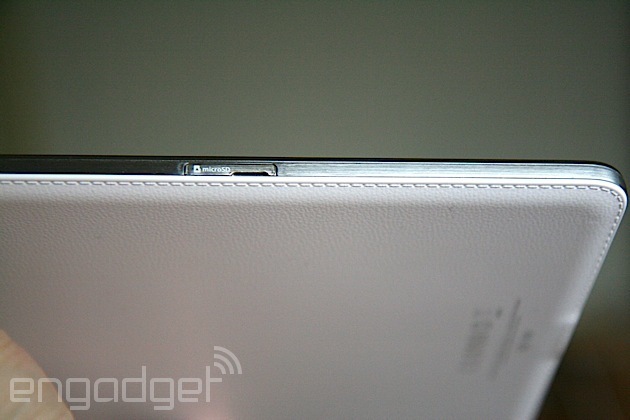 The display takes up a large chunk of the tablet’s surface, leaving a relatively slim bezel around it. Still, when holding the Tab Pro in portrait mode, my thumbs naturally rested on the screen’s edge, far enough to the side that they never got in the way. In landscape mode, however, I found myself constantly dodging the touch-sensitive soft keys, especially when settling in to watch a video. It’s a minor enough quibble, but it might prove to be quite annoying if you’re using the Tab Pro on the subway. Breaking the monotony of the faux-leather back is an 8-megapixel camera along with an LED flash. Meanwhile, the edges are home to the usual array of ports and buttons. In portrait mode, the 3.5mm headset jack sits on top, while the power, volume buttons and IR blaster sit along the right side. At the tablet’s base are a pair of stereo speakers and a micro-USB charging port that does data transfers at USB 2.0 speeds. Last but not least, there’s a microSD reader on the left side, which is absolutely crucial in a device that only comes with 16GB of internal memory (there will also be a 32GB version, but the price has yet to be announced). Aside from that, the Tab Pro 8.4 houses a 2.3GHz Qualcomm Snapdragon 800 quad-core processor, 2GB of RAM and a non-removable 4,800mAh battery. Dimensions 8.62 x 5.06 x 0.28 in. 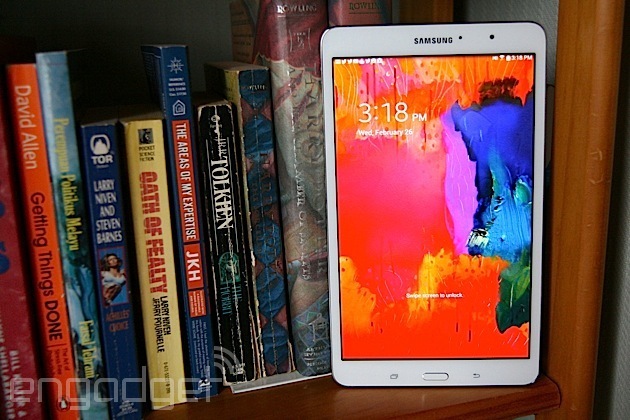 I’ll cut straight to the point: The Galaxy Tab Pro’s display is gorgeous. I was dazzled from the minute I turned it on. Like the rest of the Galaxy Tab Pro line, the 8.4 boasts an impressive 2,560 x 1,600 resolution. But, because the 8.4-inch model has the smallest screen of the lot, its pixel density is the sharpest, topping out at an impressive 359 pixels per inch. 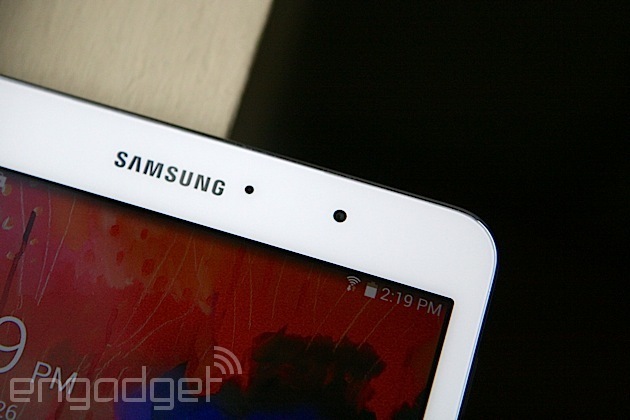 That makes the Galaxy Tab Pro 8.4 the most pixel-dense slate we’ve ever seen, and it shows. Icons and images are so crisp and lifelike that they look painted on. Further, the Tab Pro utilizes a TFT LCD instead of the Super AMOLED found in previous Samsung tablets, which results in much more natural colors, a welcome change from AMOLED’s hyper-saturated hues. This was especially apparent when we used the Tab Pro to watch movies and TV shows from Netflix and HBO Go. The tablet’s smaller screen did not deter from the experience at all — in fact, its sharpness and clarity made it a downright pleasurable experience. If you want a tablet with one of the best displays on the market, you should definitely be looking at the Galaxy Tab Pro 8.4. The Galaxy Tab Pro 8.4 ships with Android 4.4 KitKat, but as is typical with Samsung products, it also includes the company’s custom TouchWiz UI. This time, however, the Tab Pro uses an interface called Magazine UX, which you’ll also find on the new Galaxy Note Pro 12.2. It still has that familiar Android home screen we all know by now, but now, with a simple swipe to the left or right, you’ll be presented with a Flipboard-style layout that shows tiles from three different sources: news feeds, apps or social media. 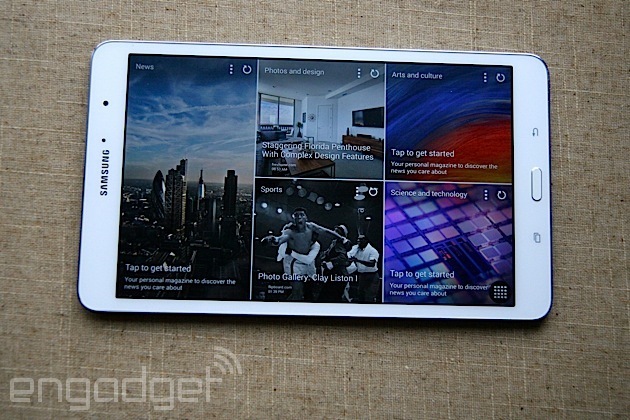 As we pointed out in our review of Note Pro 12.2, some of those news sources are in fact from Flipboard itself. So Magazine UX essentially is Flipboard, just without the name. Of those categories, your options are limited to what Samsung has picked out for you (only nine apps are listed as possible choices, for example), but they at least include essentials like calendar, email, Twitter, News and Sports. Once you set them up, you can flip through them almost exactly like you can with Flipboard. While I rather liked Magazine UX after playing around with it for a few days, its expansive tile-like layout is perhaps more well-suited for tablets with larger displays like the Note Pro 12.2. On larger devices, there’s room for more text in news excerpts — you’ll be able to read most of the story’s lede paragraph without needing to click through to the article. That’s not the case with the Tab Pro 8.4. Still, if you’re a fan of Flipboard, you might be able to tolerate such a compromise. Unfortunately there’s no way to really disable it, but then again, it’s not mapped to your home button, so it’s easy to ignore. We’re not done with the software flourishes just yet. As with other recent Galaxy devices, the Tab Pro has a Multi Window feature that lets you view multiple applications at once. Swipe left from the right bezel, and a tray of application shortcuts will appear. From there, you can drag and drop the apps to the main screen area. You can resize them so that they take up two halves of your display, or simply let them float around like pop-out windows. When minimized, the windows are reduced to tiny circular icons that you can position anywhere on the screen. Samsung’s Smart Screen eye-tracking features are here as well. When enabled, you can have the screen stay on and not go to sleep when you’re looking at it, have a video pause automatically when you glance away or simply cause the screen to rotate to whichever mode you’re looking at it. As for input methods, the Tab Pro 8.4 comes with the Google Keyboard and SwiftKey options by default. Google’s Pinyin input software is also installed if you need it. Though you can easily use the Galaxy Tab Pro to watch movies and listen to music, Samsung would like you to consider using it for more serious tasks too, if only to justify the addition of “Pro” to the product’s name. Indeed, the tablet ships with a slew of business-centric apps such as WebEx, e-Meeting, Hancom Viewer (for editing documents) and Remote PC, a feature that lets you remotely control your PC or Mac from your tablet. There are other more leisure-oriented apps too, like Flipboard, Magazine Here & Now (a location-based news aggregator that’s similar to Google Now) and Samsung’s WatchON, which acts as a second-screen remote for your home theater. If you just can’t get enough Samsung apps, there’s the Samsung App Store in addition to the usual Google Play storefront and, well, it’s exactly what it sounds like. With a 2.3GHz quad-core Snapdragon 800 processor and 2GB of RAM, the Tab Pro 8.4 theoretically offers plenty of power. And after spending some serious quality time with the tablet, I have to agree. Swiping and flipping around the tablet’s various apps and screens felt gloriously smooth for the most part, and launching most software took mere seconds. For example, in just under two seconds, I was able to launch the camera app and start taking photographs. Snapping pictures is practically instantaneous as well, which is great if you need to capture that perfect moment. I was especially impressed with how the Tab Pro fared during multitasking. I launched several apps using Samsung’s Multi Window feature, with two taking up the entire screen and a few more pop-up windows hovering above. I did things like surf the web with Chrome, play YouTube videos, check email and chat with friends using Hangouts all at the same time. And on the whole, I was able to do these tasks without serious issues. I even tried playing two or three videos simultaneously (with YouTube, Chrome and the built-in video player), and to my surprise, the videos didn’t stutter at all. That said, the more apps I launched, the more the performance started to lag; resizing windows and moving them around took a bit more patience than usual (if you recall, the same thing happened when we tested the Note Pro 12.2). Chrome also crashed once during my little multi-window experiment. While I wouldn’t recommend using Multi Window all the time, it’s at least robust enough for occasional, lighter use. As for the device’s speakers, I was pleasantly surprised by how loud and rich the stereo speakers sound. To my non-audiophile ears, I didn’t detect much tinniness, and found them perfectly acceptable for listening to tracks from Rdio and Spotify. I wouldn’t replace your best Bluetooth speakers with them of course, but they’ll do in a pinch. As you can see from the table above, the Galaxy Tab Pro 8.4 stands up well to other similarly sized quad-core tablets in synthetic benchmark tests such as Quadrant, AnTuTu and CF-Bench. Its Vellamo score, meanwhile, though not the highest, was very respectable as well. 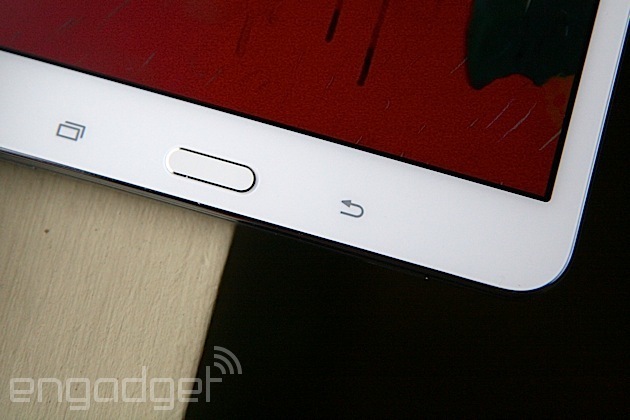 The Galaxy Tab Pro 8.4 has a 4,800mAh battery, which is a slight bump over the Tab 3’s 4,450mAh power pack. In our standard battery test where we play a video on loop with 50 percent brightness while having notifications for email, Facebook and Twitter turned on, the Tab Pro lasted for seven hours and 13 minutes. That’s substantially less than the iPad mini with Retina display and though it’s about on par with the LG G Pad 8.3, it fares much worse than Amazon’s 7-inch Kindle Fire HDX, which lasted well over 10 hours. We admittedly didn’t set the brightness as high as we should have with the 8.9-inch version of the HDX, but that being said, it did manage 15 hours in our battery test, which is more than double what the Tab Pro 8.4 is capable of. With moderate use — by which I mean checking email, surfing the web and refreshing my Twitter feed — the tablet easily lasted through a whole day. 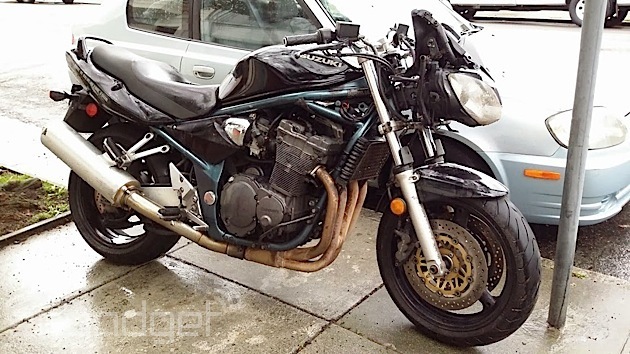 I left it mostly idle throughout the weekend, and the battery barely dipped below 50 percent. That said, the poor showing in our battery test is rather disappointing given the tablet’s otherwise stellar performance. Let me be clear: I would never advocate actually using a tablet to take photos. It just doesn’t make sense, when a smartphone could do a better job. If all you had was the Galaxy Tab Pro 8.4, however, it would work in a pinch. As on previous Galaxy products, the camera is equipped with a number of presets like Beauty Face, Best Face, Sound and Shot, Drama and Eraser. For most of my tests, though, I used Auto mode, just because that’s what most consumers are likely to do. Even then, the rear 8-megapixel camera takes reasonably good shots — my sample pictures looked crisp and colors appeared accurate and lifelike. As soon as you try to use the camera in low light, however, the quality drops considerably. In darker environments, images looked fuzzy and grainy, and I had to hold the tablet super still in order to get a shot that wasn’t too blurry. The LED flash didn’t help matters either, as it often resulted in shots that were blown out. As for the 2-megapixel front-facing camera, it’s alright for selfies and the occasional conference call, but I really wouldn’t use it for anything else given the low resolution. Surprisingly, though, the Tab Pro records pretty decent 1080p video. It captures motion smoothly enough, and it records ambient sound quite clearly. The Galaxy Tab Pro 8.4 is by no means the only 8-inch tablet on the market, but it has enough going for it to stand out from the pack. When compared to the LG G Pad 8.3, for instance, it’s just as well-designed, but sports a much higher screen resolution (2,560 x 1,600 compared to the LG’s 1,920 x 1,200) and is faster thanks to a Snapdragon 800 processor (the G Pad has a Snapdragon 600 chip). 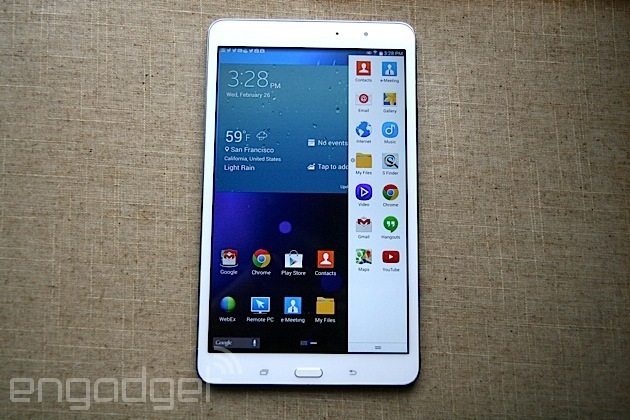 Seeing as how the G Pad 8.3 is almost just as pricey at around $350, we’d give the edge to Samsung on this one. Looking at the rest of the market, the Amazon Kindle Fire HDX 8.9 comes close to the Tab in terms of specs; it has a similar screen resolution and processor. Still, if we want to get nitpicky, the Tab Pro’s 359-ppi screen is sharper than the Kindle’s 339-ppi display, and its 2.3GHz quad-core Snapdragon 800 processor is a hair faster as well. As far as pricing goes, Amazon’s offering is about $20 cheaper at $379, but — and this is a big “but” — you won’t have access to the Google Play Store. Of course, we’d be remiss if we didn’t mention Apple’s iPad mini with Retina display, which also costs $399. It’s comparable to the Tab Pro in almost every respect. The Tab Pro’s 359-ppi screen does edge the iPad’s out by about 33 pixels per inch, but the iPad offers much longer battery life. As ever, your decision here will largely come down to which ecosystem you’d rather invest in. Despite my trepidations about the Galaxy Tab Pro 8.4’s faux-leather stitching and skinned UI, I gradually came to accept — nay — fall in love with it. It has premium written all over it, from its crisp display and sleek exterior to a robust processor that more than keeps up with the tablet’s multitasking capabilities. The downside, of course, is that it comes at a cost, with a price that’s right up there with the Retina display iPad mini. Further, its battery life is poor compared to the competition — at the very least, there’s a three- to four-hour difference between the Tab Pro and devices like the Retina display iPad mini and both of Amazon’s Kindle Fire HDX tablets. Still, if you want a thin and light tablet with top-tier performance, the Galaxy Tab Pro 8.4 is a good choice. Just be prepared to plug it into an outlet more often than you might like. CONCLUSIONThe Samsung Galaxy Tab Pro 8.4 has a sharp display, stunning good looks and great performance. However, its poor battery life and high price tag diminish its appeal. Those artificially inflated benchmark scores Samsung devices were getting last year? They’ve been patched. According to new tests run by Ars Technica, Samsung devices running Android 4.4 no longer boost CPU speeds during benchmark tests. In July, Exynos variants of the Galaxy S 4 and Note 3 were caught running their CPUs at an unsustainable max speed during benchmark programs, bolstering their total score by as much as 20 percent. Samsung suggested this was normal, claiming that varied processor frequencies were designed to provide an “optimal user experience.” The firm never clearly explained if the phenomenon was a feature, fault or foul play, but it’s over now: devices updated to the latest version of Android are apparently running clean.